Research Triangle Park, N.C.—The mice are pretty odd. Distributed among 2,000 cages, they represent a real hodgepodge: white, black and brown mice, some fat, some skinny, some with crooked tails, some huddling in corners while others scamper in circles. These mice from the University of North Carolina at Chapel Hill, awaiting a new housing facility here, aren’t mutant rejects. Instead they are a valuable new resource—the most diverse mouse strains to ever hit the lab bench. Because they more closely reflect the genetic variation of humans, they may be the key to understanding some of today’s most common, and most complex, diseases. The mice don’t have the rodent equivalent of human ethnicity; rather they simply have much greater DNA diversity. Traditional laboratory mice have a limited number of alleles—that is, different versions of the same gene. Their DNA contains only about 30 percent of the allelic diversity of the entire mouse genome, meaning that lab mice as a whole have only a few forms of each gene compared with their wild counterparts. But now geneticists have begun breeding a massive new mouse population, one that encompasses 90 percent of the diversity of the mouse genome and is on par with the natural variation in the human genome. The idea of creating these mouse strains took shape at a conference in 2001, when a handful of scientists began to commiserate over the lack of progress in the study of illnesses caused by many genes acting together. In such complex diseases, which include cancer and diabetes, scientists glean just bits of information from traditional mouse genetics, which typically involves silencing one gene at a time. “We needed a new population of animals to stimulate the field,” says David W. Threadgill, a geneticist at North Carolina State University and a leader of the project. So the researchers outlined a plan: Start with genetically diverse founding strains and breed them into hundreds of reproducible varieties with a wide range of physical and behavioral characteristics. They would have combinations of traits that today’s lab mice just don’t possess. The scientists calculated that only eight founding strains were enough to capture the desired allelic diversity while keeping the project practically and computationally manageable. But the project, called the Collaborative Cross (CC), was more easily imagined than executed. A previous attempt to create genetically diverse mouse lines by chemically inducing mutations lost funding because of low demand, so geneticists weren’t willing to funnel a cool $50 million, the initial CC price tag, into another mouse project. “If the National Institutes of Health pours a lot of money into it, and it doesn’t have a lot of impact, credibility is hurt,” says Alan D. Attie, a geneticist at the University of Wisconsin–Madison who is not involved in the project. But confident and impatient, Gary Churchill, a geneticist at the Jackson Laboratory in Bar Harbor, Maine, began breeding the initial eight strains in his own lab, including three wild-derived strains that contribute 75 percent of the genetic diversity of the CC. Soon the collaborators pieced together enough funding to commence breeding in earnest, first at Oak Ridge National Laboratory in Tennessee, later at U.N.C., Tel Aviv University in Israel, and the University of Western Australia in Perth. Today the first few strains are almost finished breeding, and the team hopes to have the initial 50 lines done by the end of 2010 and 300 to 500 completed by 2013—and at a cost of about one-tenth the original estimate. “But we can’t be sitting around on our hands,” Churchill says, so he and others have already begun using the lines, called the pre-CC, to demonstrate the usefulness of the mice, in studies ranging from basic physiology to the animals’ susceptibility to infectious diseases. The initial forays are drawing interest from federal agencies: last September the U.S. awarded U.N.C. $8.6 million for a center to study the genetics of human psychiatric disorders using the CC. Scientists outside the project are being lured, too. Samir Kelada, a postdoctoral fellow in the lab of NIH head Francis Collins, has already used around 160 pre-CC mice to study gene-environment interactions that cause allergic asthma. They include those that remain perfectly healthy after receiving large doses of asthma allergens and those that wheeze before testing even begins. “They’re just so diverse,” Kelada says. 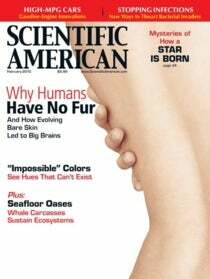 Note: This story was originally printed with the title "Mouse Mash-Up"
Megan Scudellari is a freelance science writer based in Durham, N.C.